Thirty-nine years ago, on Aug. 18, 1976, the Soviet Union successfully soft-landed its last spacecraft on the Moon – Luna 24. For 37 years, until the lunar landing of China’s Chang’e 3 probe in December of 2013, it was the last man-made object to soft-land on the Moon’s surface. Now, the Russian Federal Space Agency (Roscosmos) plans to continue the legacy of the successful Luna Program by reviving the idea of unmanned lunar landers. 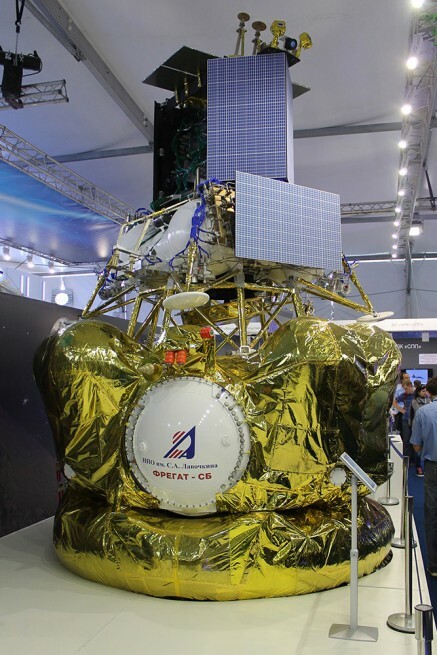 The Russian Space Research Institute (IKI) has recently revealed details about the upcoming Luna 25 (also known as Luna-Glob lander) mission that is being developed by the institute. The spacecraft is planned to give Russian researchers the opportunity to explore the Moon’s surface in depth. It should land in the vicinity of the lunar south pole and analyze the region’s regolith. Most of the instruments on the spacecraft are being made at the IKI; a life-sized model of the probe is currently being displayed for visitors at the MAKS-2015 International Air Show in the Moscow suburb of Zhukovsky. The probe is slated to land in the Boguslavsky crater, near the Moon’s south pole, where its four television cameras will take footage of the area. Another two cameras will observe the work of the probe’s digging tool, and a further two will assist it so that it may move around safely. The spacecraft will be equipped with a radioisotope thermoelectric generator, to survive the harsh nighttime conditions on the Moon. The generator will provide power by converting the heat generated by the decay of the plutonium-238 isotope into electricity. “This mission is a scientific-technological one. We want to carry out scientific experiments there, but this is a technological mission in the sense that we need to return to the Moon, learn how to land, and survive the lunar night, since a lot of what was achieved in the 1970s has been forgotten,” said Vladislav Tretyakov, a researcher in nuclear planetology at the IKI. The Luna 25 mission will include instruments that will carry out scientific research on the lunar surface and deliver detailed data about the Moon’s composition. The IKI-made instruments – such as LIS-TV-RPM (providing IR spectrometry of minerals, and TV imaging) and PmL (responsible for studying the lunar dust and micrometeorites) – will be supported by tools developed in collaboration with universities in Sweden and Switzerland. The probe will also feature the ADRON-LR instrument that will make active neutron and gamma-ray analysis of regolith. Another significant payload, ARIES-L, will measure the Moon’s exosphere plasma. The mission is included in the Federal Space program of Russia for 2016–2025. The launch of the Luna 25 spacecraft is currently planned for 2024. IKI was founded in 1965 under the auspices of the Academy of Sciences of the USSR and is now part of the Russian Academy of Sciences. I really hope this works for the russians after the frustration of Grunt-phobos and other failed mars missions. We really need other countries to explore the solar systems besides NASA and ESA. Yeah yeah yeah, talk talk talk. Luna-Glob won’t be launched in 10 years, according to plan. Russia hasn’t launched any interplanetary probe since a mission to Venus 31 years ago. ExoMars, well, we’ll see about that. I’m sure it won’t launch until the 2020s either, and I don’t bet on it succeeding, Russia never succeeded with sending anything to Mars. They have expertise with launching humans to LEO, that’s it. Russia has experience with far more than just “launching humans to LEO”. They’ve pioneered long duration spaceflight (first beyond 3 months and they have 5 people who have been or are on missions of duration of 1 year to our 1), they’ve produced the only probes (I believe 4 of them) to land on the surface of Venus, they sent plenty of successful probes to the Moon (See Luna and Lunokhod series), and they’ve sent probes to Mars that have captured some very good pictures of Phobos and they’ve soft-landed a probe on Mars. Yes, these Mars probes failed before completing their primary missions, but it is clear from these missions that they’re capable of getting a probe to Mars. Don’t get me wrong. I’ll quickly agree with you that NASA’s achievements in the solar system go far beyond this, that NASA is the world’s premier space agency, and that the Russians haven’t had any major advances in planetary exploration for some time. But don’t for a minute fool yourself into believing that this means that they are incapable of doing so. This is particularly true in today’s Russia, where Putin is committed to attempting to return Russia to what he perceives as the level of greatness attained by the former Soviet Union. In such an environment and with such a rationale, it would be relatively easy for him to justify the expenditure to bring about the missions described in this article, which are not that far-reaching. The Soviet union did indeed have an impressive unmanned program, culminating (in my opinion) in the Vega missions which included Venus landers, atmospheric balloons, and comet Haley flyby spacecraft, all in the same mission. However I’m not so certain about modern Russia’s interplanetary prospects. The Phobos-Grunt mission showed the ambition customary of the soviet program, but it seems that the program was woefully underfunded, especially considering the long neglect of Russia’s beyond-GEO capabilities. Other, higher priority parts of the Russian space effort seem to be suffering from mismanagement and corruption. If they get really serious and make it a national priority, I think they still have enough experience to revitalize the program. But personally I wouldn’t bet on it anytime soon. As you say, the Russians are great at launching humans to LEO. They’ve done that for more than half a century now. But they don’t do anything else in space. They’ve sent probes to Venus until 30+ years ago. They keep on trying to send something to Mars, but they have never succeeded. And sending a human beyond LEO in the 2020s? No, I don’t think that Russia can accomplish that. They never have. But they might in the future buy a seat from someone who actually wants and can go from LEO to the Moon. 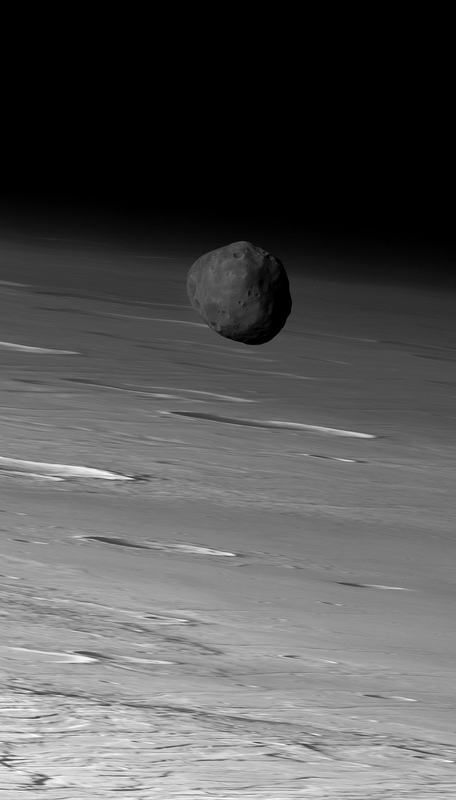 What images have the Russians presented of Phobos? No, it just isn’t their business, Russia stays in LEO because that is what is what is useful for their military.